It's Friday and that means it's time for a new block in our Friends & Companions Sew-Along! Today, you must click over to my friends at Olde Green Cupboard Designs blog. Gloria, Vicky and Heather have a brand new block that I just love,and I know you will, too!! And, now, at long last, my dear friend Lynne Hagmeier's (Kansas Troubles Quilters) new book has finally arrived! 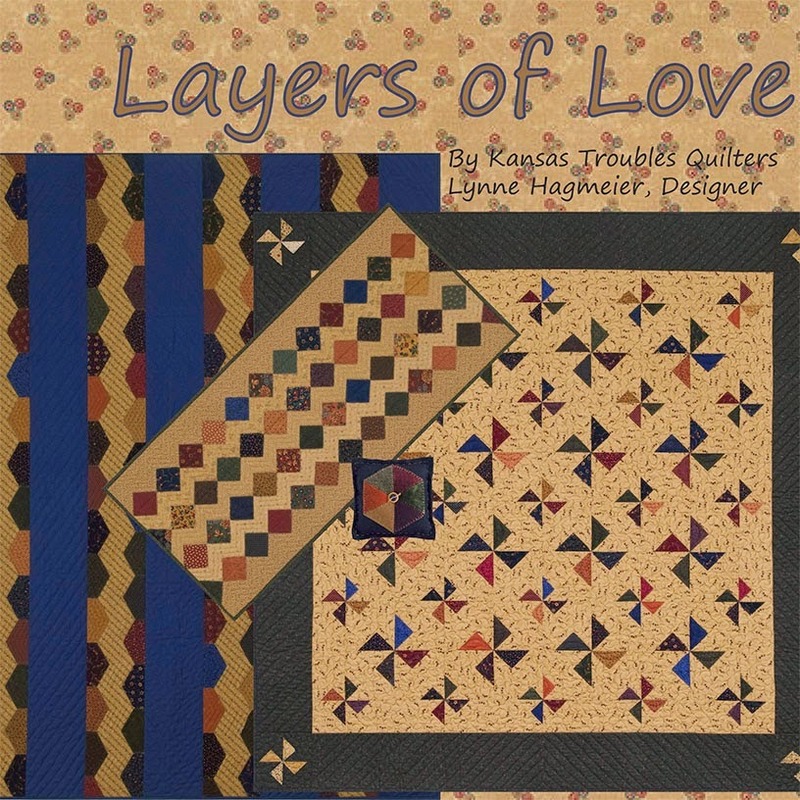 The book features her unique "layered patchwork" technique and is chock full of great projects all dedicated to her family. Look for it at your favorite local quilt shop or click here to order one from KT Quilts today. I'm still working on piecing the new quilt. Yesterday, I was running errands and grocery shopping all over town. We're having our neighbors over for dessert tonight and I'll be in the kitchen baking today. I'm excited to share my newest 'no back' dessert with you. I made it last weekend and took it to a party and everyone LOVED it. It was gone in 5 minutes. So, I'm making it again for tonight. I'll share the recipe with you. Hopefully, I'll make piecing progress over the long weekend as I have to finish this quilt in a hurry. I'm leaving for Michigan next weekend! Have a wonderful Labor Day weekend, and don't labor! Sew, sew, sew!! 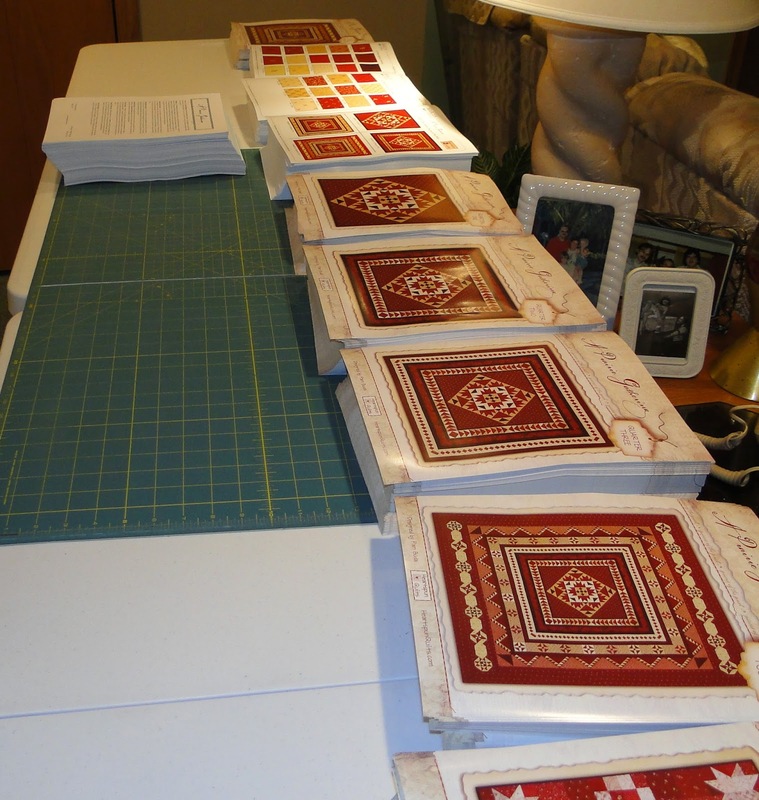 We have a big production line going on here assembling the Shop Guides for the Prairie Gathering Quilt of the Quarter program. Boxes and boxes of paper, binders, tabs and bags have taken over our basement. It's such a great feeling to see things coming together! Paper cuts are a job hazard and we keep a box of Band-Aids nearby. Oh, what suffering we do for our craft! Teehee! Meanwhile, upstairs in my studio, I'm working on one of three new small quilts going into a special new pattern using the Prairie Gathering fabrics. (Stay tuned for an announcement about why this pattern is special!) This is the center of one of the quilts. I just adore simple patchwork like these checkerboard blocks, don't you? There's just something so wonderful and satisfying in piecing these blocks. And, I think these squares show off the fabric prints very nicely. Be sure to visit the blog of my pals and fellow Marcus designers Gloria Parsons and Vicky Iannucci on Friday. Besides designing fabric, they design all kinds of lovely things for their company, Olde Green Cupboard. They will be posting their block instructions for our Friends & Companions Sew-Along on Friday, so tie a string around your finger so you don't forget! Hope you're finding some time to spend with fabric, needle and thread. Did you know that Marcus Fabrics has this collection of "New" Aged Muslins? This beautiful array of colored, overdyed muslins is a feast for your eyes to be sure. Marcus was the first company to bring you overdyed, aged muslins in the warm beige tones seen in the collection at the far right of the color card. They are all made from the highest quality goods and subtly bring that aged and worn feeling that we all love right into your quilts. Recently, Marcus took aging their muslin collection a giant step further by dying the muslin in colors and then giving them the aged look the beige fabrics have. The results are stunning! Just think of all the things you can do with these fabrics! I'm not a fan of working with solids in my Civil War repro quilts because they're too "flat" for me, but these New Aged Muslin fabrics have that gentle shading and texture that is anything but flat! I'll be cutting them up and working them into my next scrappy quilt for sure. Just wanted to share a really good thing with you! Ask for them as your local quilt shop. It's Friday!!! That means another block is ready for you in our Friends & Companions Sew-Along!! Click here to hop on over to the Marcus Mentions blog and get to know Pati Violick, Director of Marketing. You're gonna love her block! Have a great weekend stitching! Wagon Wheels Hitting The Road Again! I'm packing my bags once again to hit the road. I do love traveling and visiting quilt guilds and shops, and I am grateful for the invitations I receive. I thought you'd like to know where I'll be in the coming year, just in case it's near you. I'd love to meet you! So, here's my travel schedule for the remainder of 2014 and for 2015. My 2016 calendar is all full now. Hard to believe I'm booking dates in 2017. Crazy, isn't it? If you're in an area where I'll be visiting , I'd sure love to meet you! Don't forget to visit the Marcus Fabrics blog, called Marcus Mentions, on Friday. You'll meet Pati Violick, Director of Marketing at Marcus. All of the Marcus designers work closely with Pati and so much of the good stuff you see from Marcus has passed through Pati's desk. You'll get to know her a little better and receive her block for the sew-along, of course. Wrapping Up A Productive Week! I've had a very productive week this week. I love when that happens. All too often, I feel like I've worked and worked but don't really see progress. I do make progress, of course, but not always in a very tangible form. I've been able to work at my sewing machine early in the morning on a quilt I'm making (slowly but surely!) for a magazine submission. I've stitched in the evening on a variety of things like the wool sampler in the photo above, which has only been a WIP for four years now! I put the last stitches in it, so now I can have it framed! Yay! 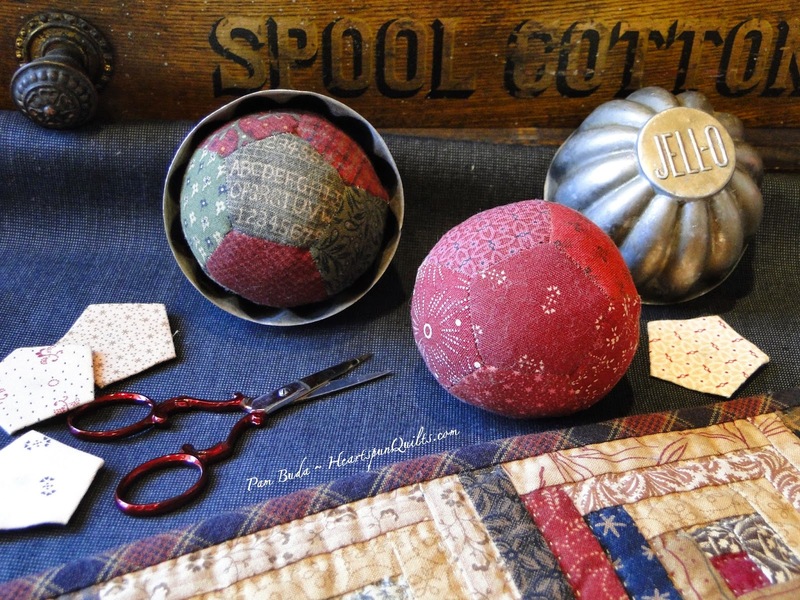 I've also been making more English Paper Pieced fabric balls. The red one in the photo above is made using the reds from my newest collection, A Prairie Gathering. I've begun to make one using the lights from the collection, too. They look so darn cute in the vintage Jell-O tin, don't they?! The pattern, called Tin Pinkeep, is available as a kit which includes the pattern, pentagon papers, and the vintage Jell-O tin (fabric not included). You can order one here. You know it's Friday, and that means that another block has been posted on our Friends & Companions Marcus Designer Sew-Along! It's Sarah Maxwell's turn. She is one half of the design team of Homestead Hearth. Click here to read her blog post and get her block info! Your quilt does not have to be quilted! We all want to see what fabrics you used and how it all turned out. Pictures have been coming to me from all over....it's going to be so much fun!! Please email your photo as soon as you can. Email to Pam@HeartspunQuilts.com with the photo as an attachment. The post man took his sweet 'ol time in delivering the latest issue of American Patchwork & Quilting magazine to me! I've been waiting and waiting at the mailbox each day for this special issue. 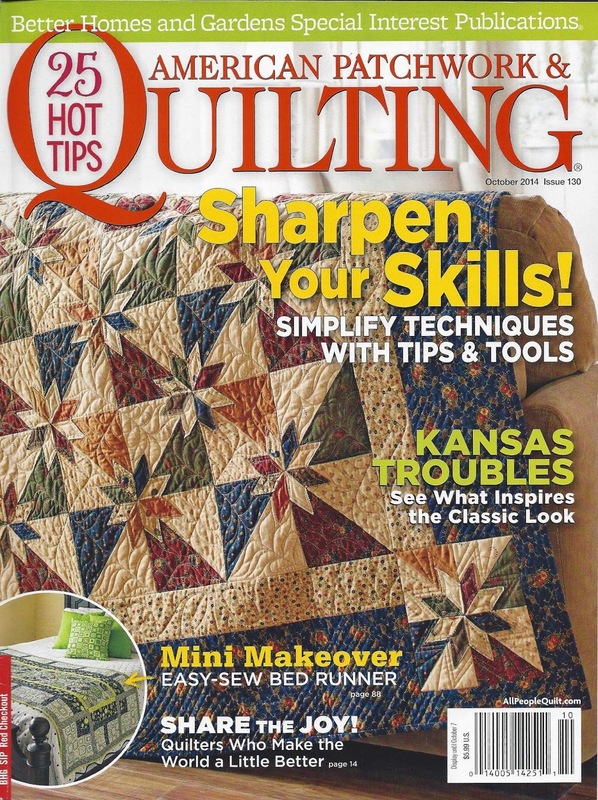 It isn't everyday when one of your very best friends is the featured designer in a favorite quilting magazine!! But...oh, it was worth the wait!! And...that's Lynne's quilt on the cover! Did you get your copy of the magazine yet? You have to so you can see all the pictures of Lynne and Robert's cabin, quilt shop and retreat center! 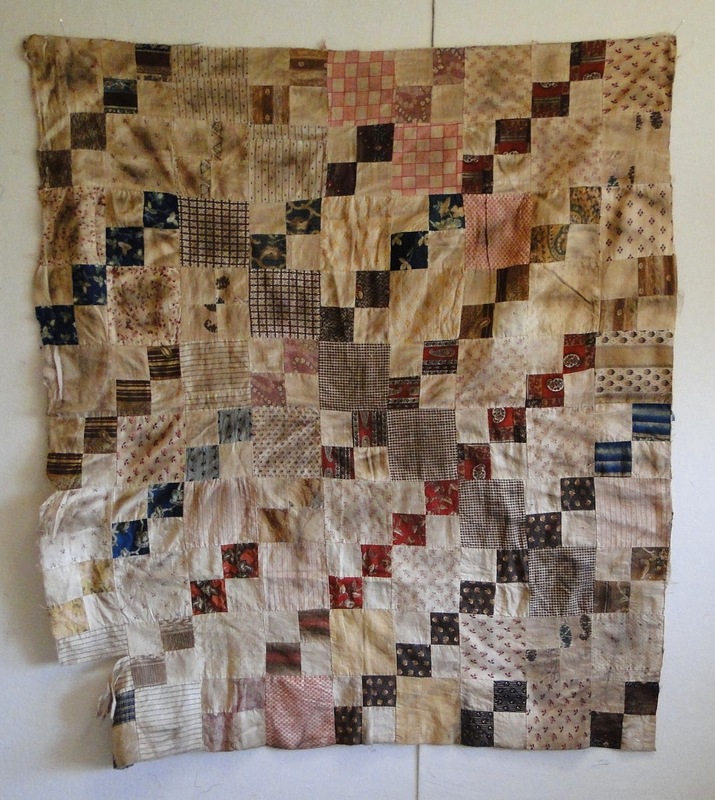 If you love vintage quilts, antiques, and of course, Kansas Troubles you'll savor every picture. Not to mention that Lynne's beautiful quilt, Rustic Stars pattern is in there. 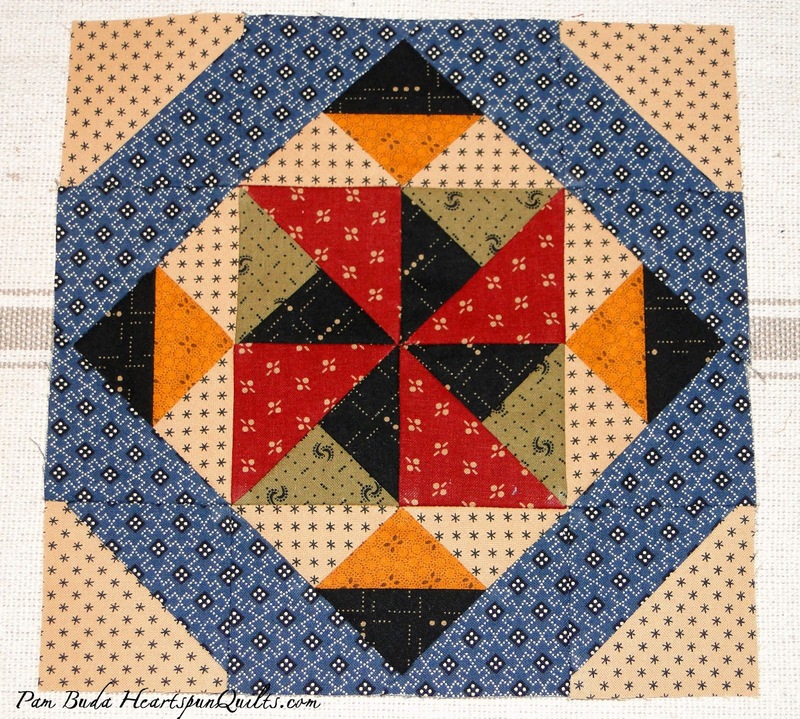 It's Lynne's simplified version of the difficult, very striking Hunter's Star pattern. I visited Lynne's cabin, shop and retreat last month. Click here to see the blog post of my visit. Congratulations, Lynne....just don't stop doing what you're doing! We all love Kansas Troubles!! 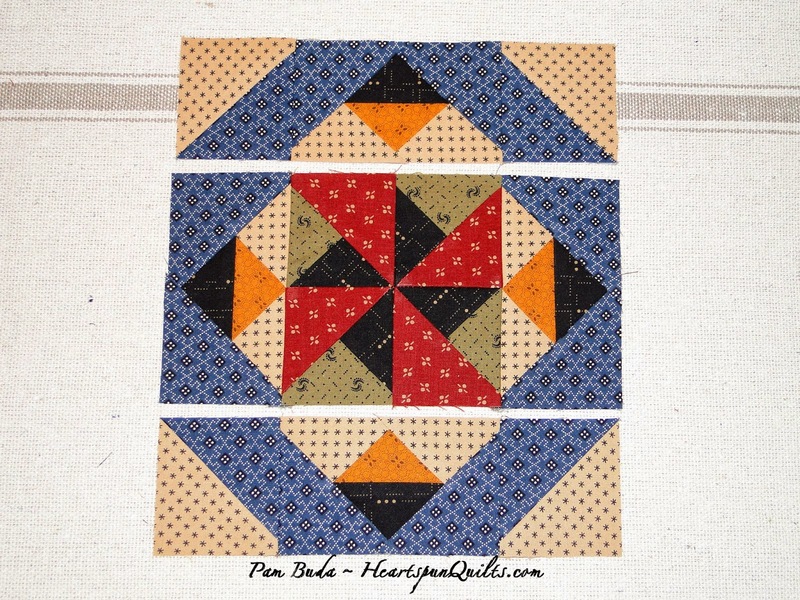 Did you visit Paula Barnes' blog last Friday for the next block in our sew-along? Her block is great...I'm loving it! Check back with her this week to see the winners of her give-aways, and remember to visit Sarah Maxwell's blog (of Homestead Hearth) on Friday for her block instructions. I also have a wonderful announcement! Erica H., who lives in the great state of Alaska, has set up a Yahoo Group for the Friends & Companions sew-along!! Our thanks to Erica for taking the time to set all of this up and be the group moderator. So kind of you! Click here to see the Yahoo Group site. Enjoy! Creativity and how it manifests itself in each of us fascinates me. I'm betting some of you are thinking you're not creative at all. In reality, we all are in some form or other. For me, it's something I have to work at. I need to feed my creative soul with inspiration. After doing this awhile, it gets easier and easier, becoming more second nature. You never know where you'll find that inspiration either. Take this ratty piece of patchwork. Would you give it a second look? It's dirty, has lots of stains, and probably lay on a garage floor somewhere. I took a good hard look and bought it for $5 at an outdoor antique show. The funny thing is the man selling this piece looked at me like I was crazy for buying it. Um, mister....you're selling it, so I guess we're both crazy. Not so crazy really. He didn't know I was really just looking at the fabric prints! I wonder what he thought I would do with this? When I say dirty, I mean dirty! Eeek! Looking closer reveals a few really sweet prints. I used two of them in my newest collection, Prairie Gathering! The first one is this sweet tiny rosebud print. Even covered in God knows what, you can see how simply lovely it will be. You can see the new Prairie Gathering fabric on the left. The team at Marcus Fabrics did an amazing job in replicating the details of the print and the soft colors, and I chose a very light mottled look for a little aging effect in the background. If you like the grungy one, you'll have to gunge the fabric yourself! Teehee!! The second print I used from my grunge patchwork is this adorable flower motif. I liked how the flowers and leaves were mostly tan with just a rim of red around them. It's really a classic old print, isn't it? Again, team Marcus produced the perfect replica...with a lovely soft, vintage look! If you'd like to see where another antique print in the Prairie Gathering collection came from, click on over to the Marcus Fabrics blog where I wrote about one of my 1800's "prairie pockets". 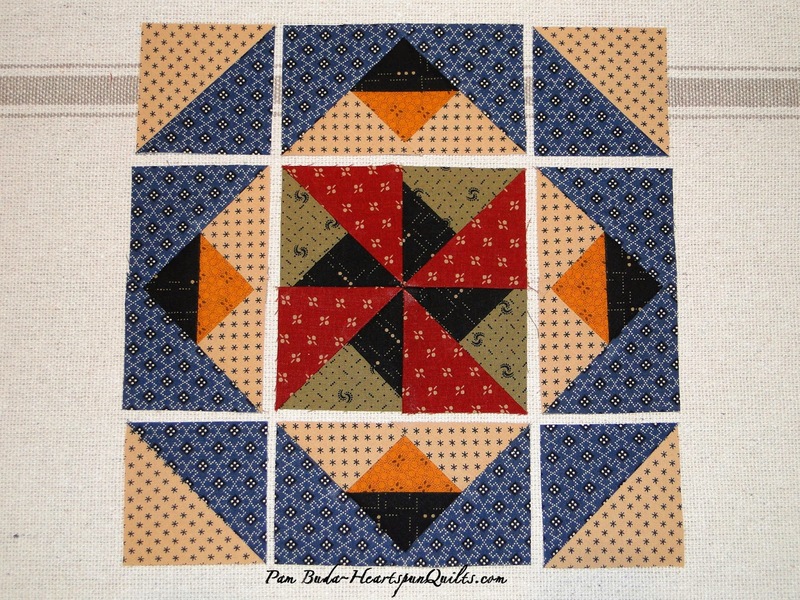 Don't forget to hop on over to my pal, Paula Barnes' blog TODAY for the next block in our Friends and Companions Designer Sew-Along!! Be sure to leave Paula a comment for a chance to win some goodies from her. Remember, if you're loving the blocks and the fabrics you see, it's not too late to purchase a kit. You can buy a Friends & Companions kit at either Homestead Hearth Quilt Shop or from Red Crinoline Quilts. Friends & Companions Sew-Along Winner!! It looks like our first Marcus Designer Sew-Along is off to a fantastic start!! My heartfelt thanks to each and every one of you who took time to leave me a comment. I so enjoy hearing from all of you, especially about your preferences, loves, and passion for fabric. Your comments are not only insightful, but prove there are lots and lots of us out there, around the world, for whom owning, collecting, and using fabric brings such J*O*Y!! For everyone in the Marcus Fabrics family, we're all about beautiful fabric, and we love bringing you the very best! So, naturally, fabric had to be part of the prize for the winner. Winner....lets make it WINNERS!! Thanks for such great directions. I love the block. I like to use any fabric that comes along. Scrap quilts are my favorites so anything goes as far as fabric lines. I most often use red, green, blue and yellow but every color has its place. I am making one quilt using your suggested colors and one quilt with blocks made from my scrap collection. Congratulations, Ursula! I'll be sending you my Abigail's Pins pattern and fat quarters from my Pin Money collection. I love all fabric in general, but seem to gravitate to smaller prints regardless of color. I enjoyed the Market Day Sew~Along very much! I just finished my Union Forever block and love It! I used fabrics from my stash with the kit fabrics as a guide. Looking forward to seeing the other designers blocks as well. Congratulations, Anonymous! I'll be sending you my Nan's Fancy pattern and fat quarters from my American Gothic collection. Ok this is my 3rd try at commenting. Pam I wanted to thank you and you design team for offering the great sew along. I have just finished making the "Union Forever" block. It was great. You advice on trimming 1/16 th" was perfect. It made the difference in this block being a difficult level to an intermediate/ experienced quilter level. It was so exact, I did not have to square up my block! Thank you again. Congratulations, Mardi! I'll be sending you my Ada's Prairie Stitches pattern and fat quarters from my Prairie Stitches collection. Winners, please email me at Pam@HeartspunQuilts.com to supply me with your mailing information. In reading your many comments, I learned that some of you are not getting my blog posts via email, which makes it very easy to print the pattern directions. Please sign-up to receive not only my blog posts via email, but all the other sew-along designers as well. You'll find the "Follow by Email" icon on the right-hand sidebar of my blog. In the meantime, you can also click here for printable instructions of my Union Forever block. We have more really great blocks coming your way each Friday in the coming weeks. Don't miss a thing! 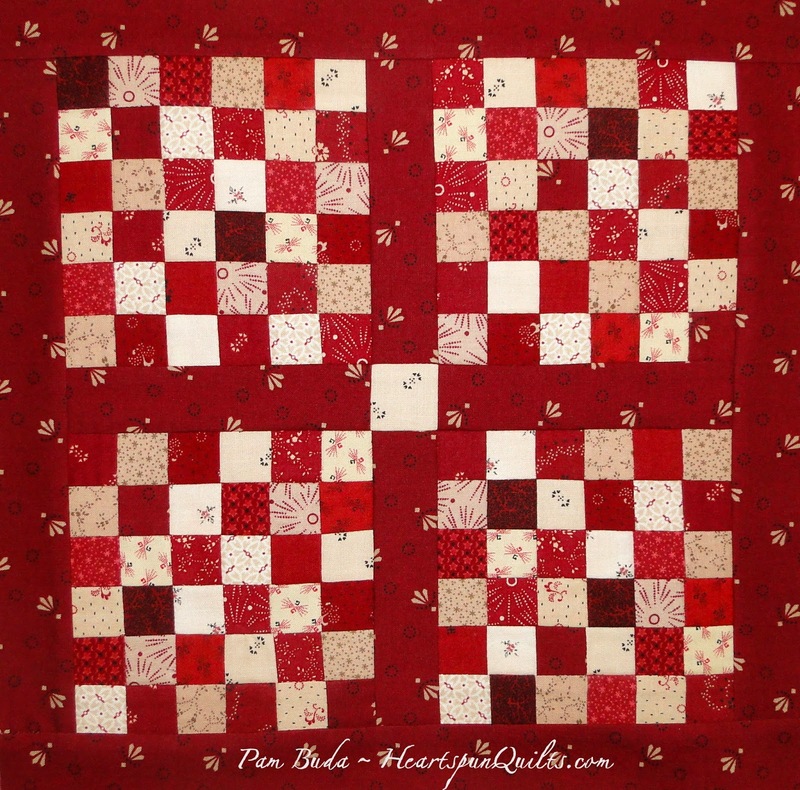 Paula Barnes of Red Crinoline Quilts will post her block on Friday. Welcome to the Friends & Companions Sew-Along!! Welcome to the first stop of our first ever Marcus Fabrics Designer Sew-Along! I'm so glad you're here!! I've been designing quilt patterns since 2004 and love traditional quilts using Civil War reproduction and country style fabrics. Click here to visit my website to see all of my pattern offerings. I'm also the creator of The Prairie Women's Sewing Circle Club. 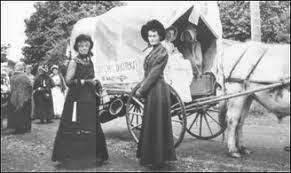 The club includes historic, anecdotal stories of what life was like for ordinary "prairie" women, c. 1840-1900, who would sew daily of necessity. The club features small quilt patterns, and lessons of how they "made-do" in all aspects of their life, and in their quilts as well. My prairie style is reflected in the fabrics I design for Marcus Brothers: sweet, traditional prints with simple country style. My newest fabric collection, called Prairie Gathering, was designed especially for my new Quilt of the Quarter program (think BOM) by the same name. 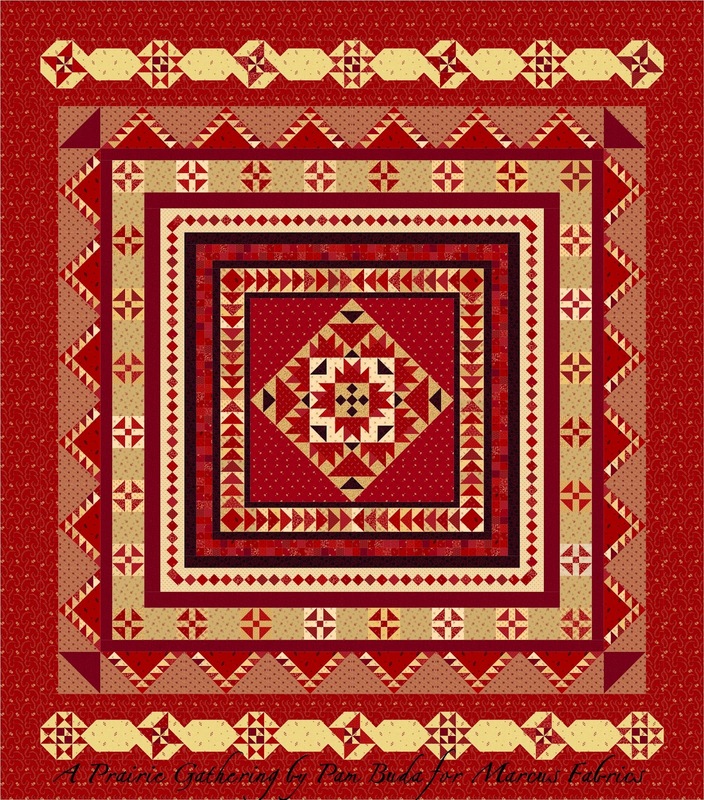 A Prairie Gathering is not your typical Block of the Month program in that it's a Medallion style quilt with pieced borders that are constructed "as-you-go". It is only available through participating quilt shops starting January, 2015. You can click here to see all of my latest fabric collections. click here for all the details. It's not too late to join us! *Cut (4) 2¼” squares; crosscut once diagonally. *Cut (1) 3¼” square; crosscut twice diagonally. *Cut (6) 2⅞” squares; crosscut (4) squares once diagonally. *Cut (2) 2⅞” squares crosscut once diagonally. *Sew the black and green print 3¼” crosscut triangles together; press to the black triangle. *Sew the red print triangles to the previous units; press to the red triangles. Make (4) units measuring 2½” unfinished. *Sew those units into a Pinwheel; press to create opposing seams. Make (1) unit measuring 4½” unfinished. *Draw a diagonal line on the wrong side of the (2) cheddar 2⅜” squares. Match each with a 2⅜” black print square. *Sew ¼” on each side of the drawn line; cut apart. *Trim each Half Square Triangle to 1 15/16” by simply placing the left and bottom edges of the Half Square in between the 1⅞” and the 2” mark on the ruler as shown. *Sew (2) light print triangles to each side of a black & cheddar print Half Square Triangle unit; press to the light print triangles. Make (4) units. *Sew (2) blue print triangles to the previous unit: press to the blue triangles. Repeat to make (4) Flying Geese units measuring 2½” x 4½” unfinished. *Use the same technique as described above for Half Square Triangles. Using the (2) 2⅞” light print and blue print squares, make (4) Half square triangles that measure 2½” unfinished. *Arrange the units for the block as shown. Sew together into rows; press for opposing seams. Sew rows together; press seams open. Your block should measure 8½” unfinished. I hope you have fun making my Union Forever block. If you're lovin' the fabrics you see, just wait until you see the whole quilt with them!! There are a few more kits available. You can order them from Paula & Mary Ellen at Red Crinonline Quilts or Sarah & Dolores at Homestead Hearth. To make this whole process even more fun, each of us will have prizes to give away! Yay! Mark your calendars to visit Paula Barnes' blog next Friday, August 8th, to see the original block Paula designed just for you! Here's the complete list of dates, designers, and blog addresses. Thanks so much for visiting my blog today, and I can't wait to read your comments! See you right here on August 4th for the winning comment!